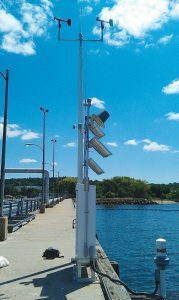 Tide gauges are inconspicuous and are located on docks, such as the one managed by NOAA in New Haven, pictured here. Starting in the 1800s, sea level has been recorded with frequency and relative accuracy in Connecticut. By 1970, the National Oceanic and Atmospheric Association (NOAA) maintained tide gauges across Long Island Sound in New London, New Haven, and Bridgeport, CT and in Kings Point, NY. Using these historic and modern sea level records, the rate at which sea level is rising in LIS can be calculated. For the last forty years, the rate is about 4mm/year. Compared to global average of 1.7mm/year, sea level along the Connecticut coast is rising close to twice as fast. According to NOAA and the Intergovernmental Panel on Climate Change (IPCC), in the current century global sea level will increase between 8in and 6ft 6in, which is a pretty large range. This is because geographic area drastically changes the effect of sea level rise, with a lot of variability close to shore. Global averages hide the variability in of coastlines. Therefore, the Connecticut Institute for Resilience and Climate Adaptation (CIRCA) produced a report which adjusted global predictions to local ones by incorporating the causes of local variability. For example, subsidence, or land sinking has a great influence on sea level predictions. Connecticut used to be uplifted but now it is sinking back, like a seesaw. Another term for land moving up and down is vertical land motion. Vertical land motion together with more localized factors (land ice melting, temperature, etc.) 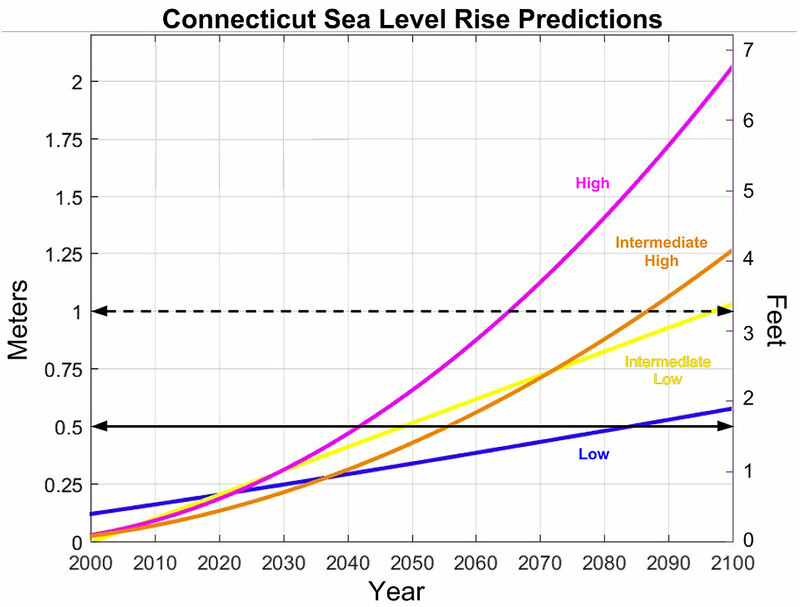 will raise sea level in Connecticut up to 0.5m, or 19in, by 2050. The following graph is a combination of predictions using different scenarios for climate change and localized factors in Connecticut. By 2050, all scenarios relatively agree. However, as they extended further into the future, there is less agreement and therefore less certainty in the predictions. “Sea level rise projections for Connecticut based on local tide gage observations (blue), the IPCC (2013) RCP 4.5 model simulations near Long Island Sound (yellow line), the semi-empirical models (orange line) and ice budgets (magenta line) as employed in the NOAA CPO-1 report (Parris et al., 2012).” from recent CIRCA publication, Sea Level Rise in CT. In the figure above, the Blue line shows an extrapolation of annual average sea level from Long Island Sound tide gages. The Yellow line shows predictions of mean sea level off southern New England in simulations from IPCC (2013). The Orange and Magenta lines are the same as NOAA’s predictions, but with local factors in Connecticut. The thick black line highlights 0.5m level, which is the center of the range of predictions at 2050 and can act as a planning threshold for the short term. The black dashed line points out the 1m mark, which can be used to predict sea level by 2100. What do these lines and predictions mean for the future of Connecticut’s coastlines? In recent years, hurricanes have especially damaged coastal towns with severe flooding, winds, and rain. With higher sea level, other storms not only hurricanes could cause similar destruction. The frequency of these destructive storms will likely increase because a greater area of land will be below sea level. It also causes concern for drinking water, because rising sea level can introduce salt water into ground water that people rely on in wells. 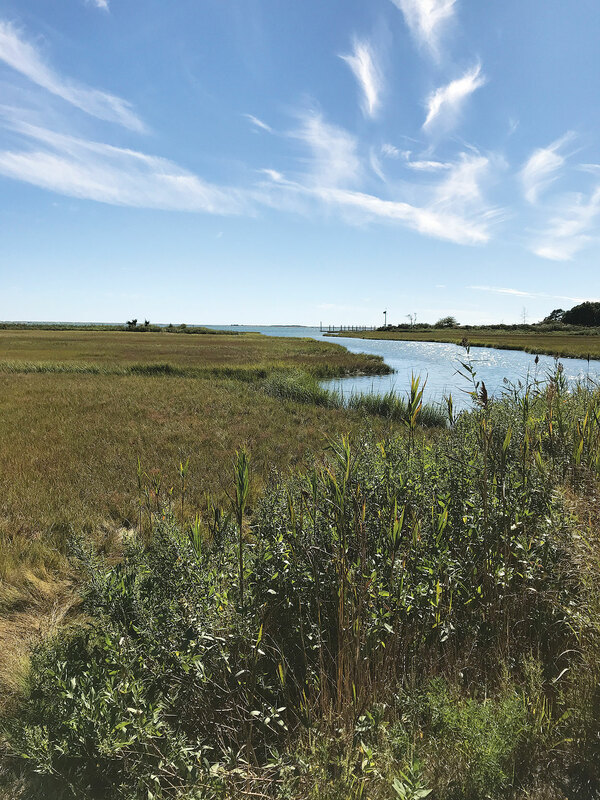 Additionally, Connecticut’s remaining salt marshes face the threat of drowning from higher sea levels. To make matters worse, losing salt marshes compounds the risk of natural disaster because they act as a natural defense of the coast by buffering waves. In face of these dangers, the Department of Energy and Environmental Protection in Connecticut is working with CIRCA to plan for the future. In the coming decades, it will be important to reassess property risks and take necessary precautions for inclement weather in coastal communities. Nobody wants to experience the damage caused by another Super-storm Sandy or Hurricane Irene! For more details, the full technical report from CIRCA, entitled “Sea Level Rise in Connecticut,” can be found at their website, circa.uconn.edu, under News. Molly James is pursuing a PhD in Oceanography at University of Connecticut, Avery Point. Under the guidance of Dr. James O’Donnell, she is currently investigating coastal salt marshes, how marshes affect flooding during storms, and the possible consequences of sea level rise in these areas. Molly graduated from Vassar College with a BA in physics.